“You are now about to witness the strength of street knowledge” – so goes the opening lyrics of the N.W.A’s most famous track Straight Outta Compton, and also serves as one of the first things we hear in the group’s biopic of the same name. That strength is what carries F. Gary Gray’s film all the way throughout, and even when it hits certain points of melodrama that come with every musical biopic, the power and ferocity of the people it’s representing is so strong that it’s perfectly acceptable to overlook its obvious flaws. 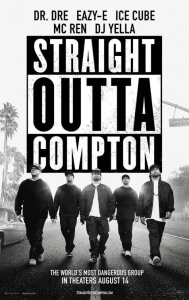 The film charts the rise of the N.W.A, which consists primarily of Ice Cube (O’Shea Jackson Jr., the offspring of the real Cube), Dr. Dre (Corey Hawkins) and Eazy-E (Jason Mitchell) – or at least, that’s who the film decides to focus on the most, while other members MC Ren (Aldia Hodge) and DJ Yella (Neil Brown Jr.) are mostly reduced to secondary background characters – and how they inspired a whole wave of hip-hop artists and even entire communities with their anti-authority stance and truthful lyrics. Of course, each member experiences hardships along the way, from contractual complications with their white Jewish manager Jerry Heller (Paul Giamatti) to the untimely deaths of close relatives. Standard biopic fare, you might assume; but the film is endlessly entertaining and, even at nearly two and a half hours, never boring which gives it an edge that similar biopics might not have been able to have. Gray’s direction manages to highlight the obvious racial boundaries that the group members and other black civilians at the time were forced to go through – there are multiple instances of racist police officers manhandling our protagonists based purely on what they look like – without sugar-coating it for a wider mainstream audience. The LA police force depicted in this film are as brutal and assuming as they would have been around the time of the Rodney King incident – in one scene, each member of the N.W.A is forced on the ground outside their recording studio by a couple of police officers (one of whom is significantly also black), and refers to Heller as their “master” when he comes to their aid. In the context of this film, they are clearly bullying obstacles that the group needs to overcome in order to succeed, and Gray portrays this struggle as some sort of crowd-pleasing resolution when they do in fact rise above the pressure – but again, it’s entertaining enough to ignore much of that. The film also benefits from its casting, placing into the roles of the group members a fine bunch of young and untested actors who are more than up for the challenges that the script requires, and each one of them leaves an extremely impressive mark as a result. Jackson Jr., aside from being almost the splitting image of his father, is able to replicate Cube’s mannerisms down to a tee while also making the role decidedly his own, though we wonder how strange it must have been for the real Ice Cube, one of the producers of the film, to have watched his son on set score with several groupies and other adulterous activities whilst playing his own father. Hawkins, as Dre, exhibits a certain on-screen charisma that will surely carry him a long way in his career, with this being a perfect example of a breakout performance; he’s emotional, he’s enduring, and he’s even funny at times. The true stand-out, however, is fellow newcomer Jason Mitchell as the late Eazy-E, who the film dedicates itself to in its closing credits. The closest this film gets to a true main protagonist, even opening with his character during a drug deal that soon becomes interrupted by a violent police raid, Mitchell carries the weight of the film on his shoulders and delivers some of the film’s strongest emotional scenes with his natural on-screen abilities, and gets you to care unreservedly about his character which makes this one of the better tributes to the late rapper. What some critics will have undoubtedly highlighted about this film is its, erm, less than honourable portrayal of women, and to be honest it’s for good reason. When the female characters aren’t crying or emotional banks of support for the men, they are mostly portrayed as sultry groupies with hardly any clothing (or sometimes, none at all). It also neglects to reference the women that had allegedly been physically assaulted by their partners (former muses of Dr Dre have recently made public their own disappointment with the film’s lack of mention of their own suffering), or even some of the female artists that N.W.A members worked with in the studio, such as JJ Fad or Tairrie B. As far as the male-dominated movie seems to be, the N.W.A certainly does not stand for the National Women’s Association. It’s likely that there are some dramatized versions of real events that may distort things slightly for the common viewer – scenes such as Ice Cube trashing a record producer’s office seem a little exaggerated, and representations of other figures such as Suge Knight (played by R. Marcus Taylor) as a borderline psychotic can be somewhat cartoonish. However, none of that really seems to matter because, at the end of the day, Straight Outta Compton is a compelling and well-crafted cinematic experience that you’ll forgive the dramatized nature of it all. It is, as Dre would call it, “dope”. 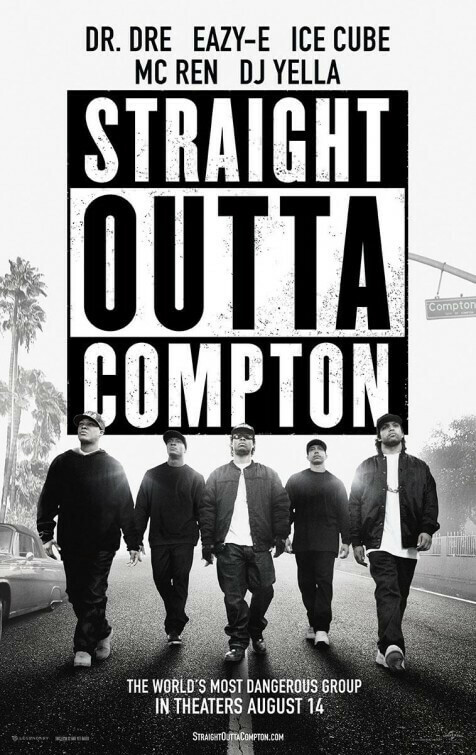 Straight Outta Compton is a very entertaining biopic of the N.W.A, with F. Gary Gray’s committed direction and pitch-perfect performances by its talented cast being more than enough to forgive its more obvious flaws.